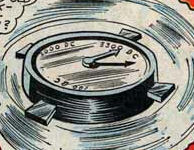 Powers/Abilities: The Clock of Ages allows Tommy to travel to any point in the past, and then safely return. Tommy is a good scrapper considering his age. 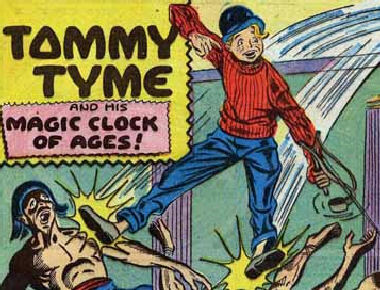 History: School boy Tommy Tyme managed to catch a genie while fishing one day. Granted a wish, Tommy states he hates school, so the genie gives him a magical "Clock of Ages" which allows him to travel anywhere in history, so that he can ask various historical figures the answers to questions his teacher sets him. Naturally anytime he makes such a trip, some sort of adventure occurs.